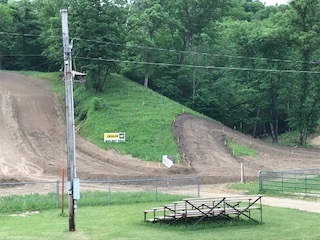 Here is a picture of the track change at Millville for the June 10th Race. We've been tweaking the corner before Cat Hill so it flows better. Come check it out this weekend. Also we made some more changes back on the KTM Micro track from all the feedback from the 50cc racers from over Memorial Weekend. Newer PostATV MX @ Cambridge this weekend.